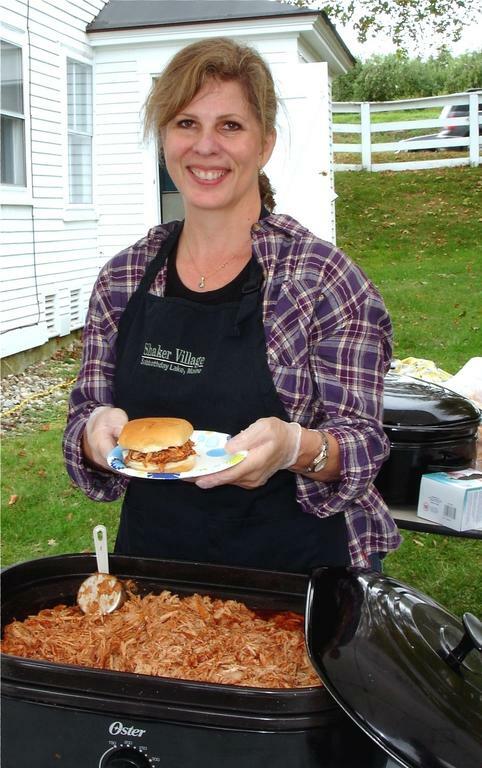 Callie Kimball, a longtime member of The Friends of the Shakers, volunteers at Sabbathday Lake Shaker Village’s Harvest Festival by serving barbecue pulled pork sandwiches to the throngs of visitors in attendance on Oct. 7. Kimball is a resident of Cape Elizabeth. There will be a special Town Meeting held on Monday, Oct. 16, at the Memorial School Gymnasium, 86 Intervale Road. The primary issue is whether or not to borrow $4.6 million plus interest to construct a new public works facility at 611 Lewiston Road, beside the current fire-rescue station. Warrant articles can be viewed at www.newgloucester.com. Check-in begins at 6:30 p.m., and the meeting begins at 7 p.m.
Town Hall will be closing at 5 p.m. that day to allow staff to prepare for the special Town Meeting. The public is invited to join members of the Royal River Riders Snowmobile Club at their Fall Dance, featuring The Veggies from 8 p.m. to midnight on Saturday, Oct. 21. Using the catchphrase, “Lettuce turn up the beet,” the whimsical band plays classic rock and some country rock. Doors open at 7:30 a.m. at the American Legion Post 86, 15 Lewiston Road, Gray. There will be a cash bar, 50/50 raffle and a few door prizes. Tickets are $10 in advance or $12 at the door. Call Andrea at 577-2563, Candi at 831-0449, or message them through the club’s Facebook page. Family historian Anne Gass will speak on “Women’s Suffrage in Maine and the USA” at the Thursday, Oct. 19, meeting of the New Gloucester Historical Society, beginning at 7 p.m. The talk, which is free and open to the public, will take place at the New Gloucester Meetinghouse, 389 Intervale Road. Refreshments will be served. October is National Substance Use Prevention Month and Casco Bay Region schools are uniting to promote the health and well-being of youth in our communities. Middle and high school principals from Yarmouth, Falmouth, RSU 5, SAD 51 and SAD 15 are committed to working together in preventing and reducing youth substance use in their schools and communities. They are promoting the campaign Back Each Other Up with tips for parents on talking with their kids about the risks of drug or alcohol use. The campaign is in collaboration with Casco Bay CAN (Create Awareness Now) and further supports the school leaders’ shared vision of positive youth development. For more information and tips visit www.cascobaycan.org. The 2017 Business Summit is set for Wednesday, Oct. 18, from 5:30 to 8 p.m. at the Coolidge Family Barn, 1084 Lewiston Road, New Gloucester. The program is sponsored the Gray-New Gloucester Development Corporation in cooperation with the Town of Gray CEDC and the New Gloucester EDC. Festivities begin at 5:30 with networking appetizers and cash bar before and after the speakers. The program includes economic development updates, and Kai Smith of Buoy Local will talk about the economic benefits of shopping locally. Those interested in attending may register at www.gngdc/business-summit-2017 or by calling Tracy Scheckel 232-5557. Parking is available at the Amvets Post 6 lot. The Caring Community of GNG is a volunteer group organized in 2007 to provide holiday assistance to individuals and families in the towns of Gray and New Gloucester. At Thanksgiving, food baskets are distributed to those who find themselves in need. Applications for Thanksgiving assistance are now available and completed forms are due back no later than Thursday, Nov 9. The forms will be distributed in the elementary school totes as well as through the school email and can be picked up and dropped off at all of the SAD 15 schools, middle school and high school guidance offices, Gray Public Library and both Gray and New Gloucester town halls in the designated CCGNG lock boxes. You are invited to be a sponsor. Sponsors adopt a family/individual and provide all the fixings for a holiday meal. Those interested in becoming a sponsor for Thanksgiving may contact Kathy George at kgeorge2@maine.rr.com. Every year there are more families than there are sponsors, so monetary donations are needed and appreciated. Donations can be sent to CCGNG, P.O. Box 1244, Gray, ME 04039 For more information, contact Christina Foster at winkers92@yahoo.com or 233-0828. The 13th annual Gray-New Gloucester Community Craft Fair will occur on Saturday, Nov. 4, from 9 a.m.-2:30 p.m. at GNG Middle School, 31 Libby Hill Road, Gray. Reserve a spot by emailing mswett@securespeed.us.